This predominantly Métis community is located in the boreal forest on the western shore of Pinehouse Lake. 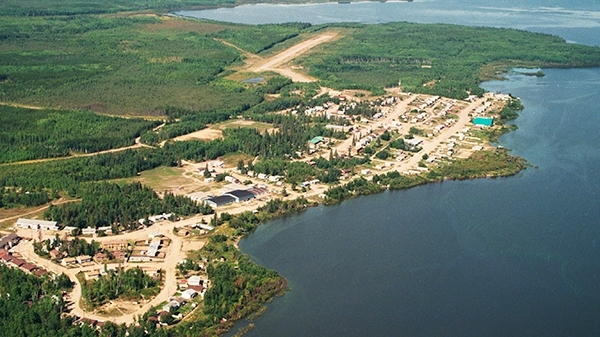 Located approximately 198 kilometers from the nearest Cameco operation at Key Lake, the community of Pinehouse is connected to other communities via an all-weather gravel road and local airport. Cree is the mother tongue for most of the residents in this community of about 1,400 people. Like many other northern communities, Pinehouse has a very young population, with about 48% under the age of 20. The area has long been a centre of trade, the northern part of the lake home to Hudson Bay’s Souris River trading post from 1875-1939. Around the turn of the century, a small group of Aboriginal families from along the Churchill River came together at the settlement where the growing community of Pinehouse now stands. Today, great efforts are being taken to increase successful graduation rates of the young population. An infant daycare also exists in the high school to assist parenting students. There is also a large emphasis on bringing training programs into the community. This has included training and apprentice programs in carpentry, heavy duty mechanics, tourism and hospitality and camp services. Aboriginal medicine wheel and circle of courage healing methodology are included in this programming and high risk students are targeted. Pinehouse residents continue a variety of traditional and cultural activities, including hunting, fishing, trapping and gathering. Annual Cultural camps for youth and annual Elders Gathering help to educate citizens and preserve the traditional ways of the Pinehouse Métis community. In December, 2012 a Collaboration Agreement between Pinehouse, Cameco and AREVA Resources formalized the long-standing relationship between northerners and industry. Their 2017 Report to Pinehouse Community Members outlines the year's progress and financial highlights.